An American Citizen Tried to Join ISIS. Does That Make Him an ‘Enemy Combatant’? If the Pipe-Bomb Mailings Weren't Terrorism, What Is? A 13-month legal saga ended quietly last week when an American citizen accused of joining isis went free. For more than a year, the U.S. military had held him in Iraq without charging him. At one point, the government offered to release him somewhere in Syria with a cellphone and a few thousand dollars, an outcome his lawyers said would amount to a death sentence. In the end, he was transferred to a third country and let go. One case, then, is settled. The larger questions underlying it—the same ones three successive presidents have failed to resolve—are very much not. Where exactly are the limits on the U.S. government’s authority to detain “enemy combatants,” including U.S. citizens? More fundamentally, where are the limits on America’s wartime powers in a war on terror that never seems to end? The case of the man court documents identify only as John Doe “was a really, really important opportunity for clarification, and it ended after 13 months with none,” said Stephen Vladeck, a law professor at the University of Texas who has followed the case closely. The case began last fall, when, according to a government court filing, a dual American-Saudi citizen turned himself in to Kurdish forces in northern Syria. He was carrying around $4,000, two thumb drives, a GPS device, and, oddly, a scuba mask and snorkel. The Kurds handed him over to the Americans. Within days of the man’s detention in September, The Daily Beast reported that an American citizen was being held incommunicado by American forces, and the ACLU promptly mounted a challenge, declaring that he was entitled access to a lawyer. Jonathan Hafetz, the lead attorney on Doe’s case, considers his client’s release a major victory. A Defense Department spokesperson said the case has resulted in no official policy change to detainee operations. While Doe’s case is a rare instance of an American being swept into wartime detention by the U.S. government, there are a handful of precedents. Perhaps the most important of these is the case of Yaser Hamdi, an American citizen accused of fighting against the United States alongside the Taliban in Afghanistan. In the 2004 case Hamdi v. Rumsfeld, the Supreme Court decided the administration could indeed hold people, including U.S. citizens, as enemy combatants—entailing indefinite detention without charge—but had to let them challenge the basis for their detention. As Vladeck pointed out, though, the Hamdi ruling spoke only to the specific circumstances of Hamdi’s own capture. It said nothing about people who weren’t captured on the Afghan battlefield. Since then, the War on Terror has stretched on and morphed. And while the courts have weighed in on military detentions of American suspects accused of affiliation with al-Qaeda or the Taliban, it remains a matter of debate whether those precedents apply to the war on isis. The fact that the Doe case was settled without going forward means that question remains open, and it affects much more than the fate of just one man. The flow of foreign fighters to the Islamic State at the group’s peak in 2014 and 2015 was an unprecedented global phenomenon. Conflicts in Afghanistan in the 1980s and Bosnia in the 1990s had drawn their own international cadres of jihadist fighters, but never in such numbers. In late 2015, the Soufan Group, a private intelligence firm, estimated that perhaps around 30,000 fighters had traveled to join isis and other extremist groups in Iraq and Syria. Americans represented only a small number—then–FBI Director James Comey estimated in 2014 that there were about a dozen or so fighting alongside the group, out of more than 100 who had tried to join or who had been killed or arrested. In the U.S.-led war that pushed isis from most of its territory, many thousands of foreign fighters have died. Thousands more have returned home, where they might either face charges or walk free. (Researchers at George Washington University’s Program on Extremism identified 12 Americans who returned to the United States, nine of whom were arrested.) Others have dispersed to wage guerrilla warfare in Syria and Iraq. Who’s left are the captives. And their status is uncertain. 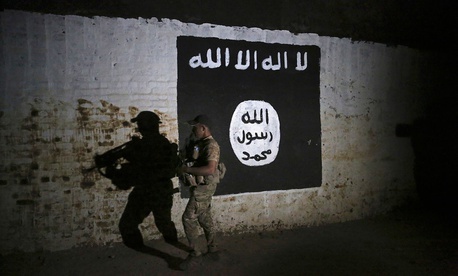 As the Islamic State’s territory shrinks, the number of suspected isis prisoners has grown. Doe had the distinct advantage of being an American citizen, held by American forces, and subject to American laws. If there are other American detainees among the prisoners, it’s not public knowledge. The rest are being held by the Syrian Democratic Forces (SDF), the U.S.-backed and Kurdish-dominated militia that holds a swath of territory in northern Syria. The U.S. military now estimates that they number some 700 people from 40 different countries. A small number have been sent back to their home country, and the U.S. position is that each country should handle its own citizens. But many of those countries do not want them back. The United States, which supports the Kurds, doesn’t want them either. International law prohibits sending them into the custody of governments, possibly including Syria’s or Iraq’s, that might torture them. The Kurds are not a sovereign government, and over the long term it’s not clear they will keep the territory they now occupy, if either the Syrians or the Turks try to drive them from it. That means that as one phase of the war on isis closes, a suspected multinational force of fighters is sitting in custody in northern Syria, and no one knows whether they will stay there or where they will go. Doe’s drama is over. But a much larger one is just starting.